Whenever you play a table tennis match you should always have a match strategy. Discover how to plan yours here. Whenever you play a table tennis match you should always have a strategy. But what is a match strategy? Well it's a plan of action which sets out how you intend to beat your opponent. You don't necessarily need to have it written down, but you should know what it is before you start your match. 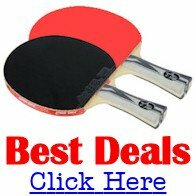 Before you can implement a match strategy you need to have developed your own table tennis skills to a sufficient standard. This means that you must be able to keep the ball in play for an extended period of time, and also be able to direct the ball to different positions on the table tennis table. If you are unable to play certain strokes, or you don't know how to counteract your opponent's spin, then you won't be able to fully implement a good match strategy. But you will still be able to use certain principles in order to outwit your opponent. However, if you are playing against a player who is at a much more advanced level than you, then it is unlikely that any strategy you employ will be effective, because of the difference in playing standard. But if you are playing against a player of a similiar standard to yourself, even if they are slightly better than you, you can use a good strategy to beat them. Before you can use an effective strategy the first thing you need to do is to make sure that you can play the four basic strokes - the backhand push, the forehand drive, the backhand drive and the forehand push. I have explained these basic strokes and also provided videos here. You'll also need to have developed basic table tennis serves which enable you to play the ball to a particular location on the table tennis table and be able to impart topspin or backspin onto the ball when serving. And before you start to develop a strategy for any opponent you'll need to analyse your own strengths and weaknesses and know what style of play you prefer to use. Then you'll need to analyse your opponent's playing style and develop your match strategy. The best way to analyse your opponent's playing style and their strengths and weaknesses is to watch them play several times. 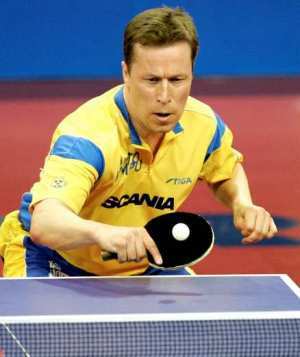 However, this is not always possible if you're playing in a competition or playing at a different table tennis club. In those cases you'll need to use the warm up period and the start of the match in order to develop your match strategy. During the warm up period you can usually establish whether your opponent is stronger playing backhand strokes or forehand strokes, and whether he is an attacker, a defender, a counter-hitter or an all-rounder. When you start the match you should then vary your serves in order to work out what type of serves your opponent finds the most difficult. And when you're returning service you should also vary your returns in order to establish whether your opponent has problems with particular shots. So let's take a closer look at this first element of developing a match strategy... analysing your opponent.